What did Bartolo Colon teach us about our place in the universe last night? Special philosophical correspondent David Roher was at the ballpark to witness the veteran Yankee's performance against Oakland, as Colon fell behind the A's 5-0—with two of the runs scoring after he'd left the game, on a double served up by his former rescuer, Boone Logan. 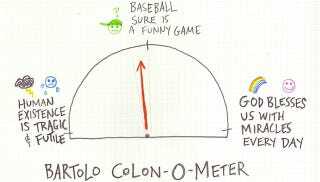 What Does Bartolo Colon Mean Today? "He wasn't as sharp as he has been, and that combined with the failure of the offense and bullpen to create a pervading sense of frustration," Roher reports. Nick Swisher, who hit a three-run homer in the bottom of the eighth for the Yankees' first runs of the game, batted again with the bases loaded and two outs in the bottom of the ninth. The batter before, Robinson Cano, had just walked to cut Oakland's lead to 6-5, on a pitch that looked an awful lot like a game-ending strike three. And then Swisher hit another deep fly ball—caught just shy of the wall by a running Coco Crisp to end the game, leaving Colon on the wrong end of a one-run loss. It was his fourth consecutive winless start. His line: 6.1 IP, 8 H, 5 R, 5 K. There are lots of twists and turns in sports, just like in life.